Eventually on your Windows 8 tablet, you’ll need to select a file from within a Start screen app. For example, you may want to open a photo to view in the Photos app. That’s where the File Picker comes in. 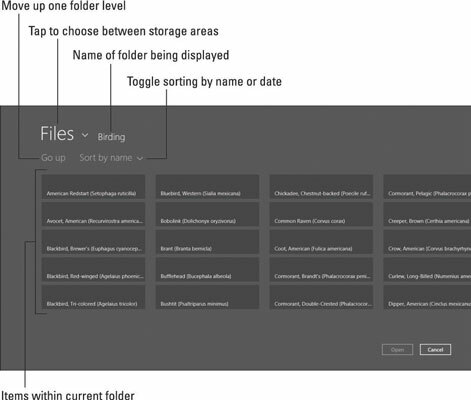 It’s not much of a file management tool, but it works fine for selecting a few files or folders when needed. Oddly enough, the File Picker can’t be summoned on its own; there’s no way to fetch it and simply browse your files. When you want to browse files, head to the Desktop app and run File Explorer. No, the File Picker can be summoned only from within a Start screen app. When it appears, you’ll see it’s a bare-bones program, designed merely to navigate storage areas and find a file or two. Tap the word Files in the screen’s upper-left corner and choose the storage area containing your file. You can also access places outside of your tablet. You can access files shared on your Homegroup by other networked PCs, as well as files stored on SkyDrive. Some of your apps may have added their storage spaces to the File Picker’s menu, as well. Tap the folder or storage area you want to open, or tap the file you want to select. If you see your file’s name, tap it, and you’re through: Your app opens it. Tapped the wrong folder by mistake? Tap the words Go Up, just below the Files button, to return. If you don’t see your desired file, keep tapping folders, opening different ones to keep looking. Still can’t find your file? Then summon the Charms bar and tap the Search icon. The Search feature can find it fairly quickly.